The new 2018 Land Rover Discovery Sport has been introduced in India with a suite of advanced technology features and latest in-car infotainment. These provide a more connected experience, especially to the tech-savvy customers in the country. These include Wi-Fi Hotspot and Pro Services in addition to the existing InControl Apps feature. The Wi-Fi Hotspot uses a customer sourced SIM to provide in car access to a 4G hotspot for up to eight devices. This easily allows the occupants in the car to simultaneously stay connected, work or be entertained throughout the journey. Additional services which undoubtedly enhance the vehicle’s infotainment capabilities have also been included under ‘InControl – Pro Services’ to deliver an even richer and more connected experience. The key features of these services are the Route Planner App. Available from Apple Store or Google Play Store, the App allows one to navigate to the end destination and sync routes with the vehicle’s navigation system. The Commute Mode feature on the other hand learns a regular route and displays diversions if there are delays on the existing regular route. Another interesting Sharing ETA (expected time of arrival) feature allows sharing of updates with certain contacts on/via SMS. I drove the new 2018 Land Rover Discovery Sport HSE Luxury with 5+2 seater which combines design excellence, engineering and versatility to create a premium compact sports utility vehicle that fits multiple roles. 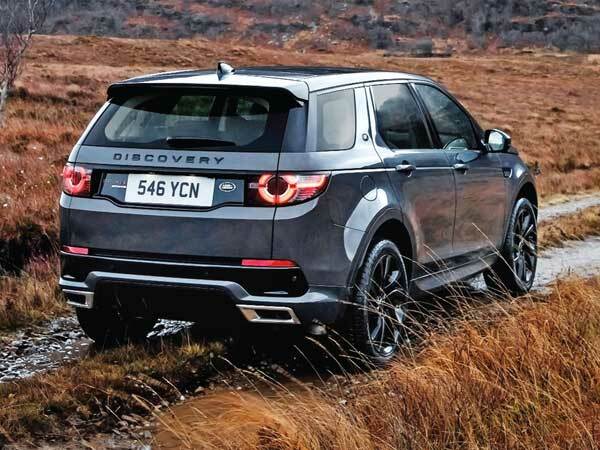 You can drive the Discovery Sport with ease to work, take the family out over the weekend in safety and luxury, and when the going gets slushy, rocky or slippery, you can just rely on the SUV’s off-road modes to enjoy the long drive without any hassle. The Discovery Sport is indeed cleverly packaged SUV that is practical, comfortable and definitely good to drive. This is a modern and compelling vehicle, with its well-proportioned compact body and purposeful stance. Its distinctive silhouette and beautifully sculpted surfaces all combine to create a vehicle that truly connects on an emotional level. In fact, Discovery Sport is ready for anything. Characteristic design cues complement perfectly balanced proportions. Strong dynamic lines and robust detailing signal Discovery Sport’s incredible breadth of capability. Signature features include a clamshell bonnet and distinctive two-bar grille with hexagonal mesh. The fast bonnet line with a pronounced step into the rising beltline conveys a dramatic stance, whilst the roof tapers subtly downwards, adding extra dynamism. As far as the interior is concerned, the cabin with bold horizontal and vertical lines is complemented by clean surfaces, and superb finishes, and optional premium leathers that give a luxury feel to the highly versatile interior. It features high-quality materials and a strong vertical centre console design to reflect the premium exterior. The cabin is equipped with 12 V power points and USB charging socket. These can be specified for all three rows of seating, allowing multiple electronic devices to be charged simultaneously. The 25.4 cm (10) touchscreen is a superb addition to the contemporary, clean interior and becomes a centrepiece of the facia. With a 21:9 wide format and 80 per cent more pixels than the standard 20.32 cm (8) touchscreen. This feature is fitted as standard on HSE Luxury models. Equipped with Jaguar Land Rover's new generation powertrain family called Ingenium, the diesel engine gives a better performance, higher fuel economy and quieter running, whether on city roads or highways. Driving the Discovery Sport is easy and relaxed in the city. It is also cool and confident, if a bit noisy, at highway speeds sometimes. But for an SUV, of this size and weight, it is too good around the bends and corners too. There is hardly any slack when it comes to the steering response. The new Ingenium engine unit is quieter, more refined and freer revving. While it is peppier on the move, it also makes the Discovery Sport feel lighter and more spirited than both its weight and power output might suggest. The four cylinder 2-litre diesel, still mated to a smooth shifting nine-speed torque converter automatic, makes 177 bhp and 382Nm of peak torque. With a claimed top speed on 188 kmph and accelerating from 0-100 kmph within 8.9 seconds, this vehicle is not slow or lethargic by any account. Also, the throttle response on testing the car felt sharp, the turn of speed energetic and courtesy the steering mounted paddle shifters, the Discovery Sport never ever felt dull or detached even when charging up a twisted hill road drive. The 2018 Land Rover Discovery Sport HSE Luxury at Rs 59.25 lakh has everything practical about it to be able to decide to buy one. It is spacious, has adequate road presence and above all bears an iconic name. But the tempting rivals in the Indian market are Mercedes GLC at about Rs 54.10 lakh, the BMW X3 at about Rs 56.70 lakh, the Volvo XC60 at Rs 57.90 lakh and the Audi Q5 at about Rs 59.79 lakh. Passenger vehicle sales in January continued to remain tepid with top six carmakers reporting flat and decline in sales. Japanese automaker Nissan on Tuesday launched its new compact SUV model Kicks in India to take on rival SUVs in the world’s fifth fiercely competitive car market in India and to boost sales.